Army life. Army wife. I’m thoroughly enjoying both right now and I thought it might be fun to give you a peek into why that is so! I have met some pretty amazing people in the last few years–people who inspire and challenge me, encourage and deepen me. The connections are made quickly because of the similarity of circumstances and then enforced by time, common experiences, and need for a support system. It’s still amazing to me to hear Army wives talk about being together in Korea, Germany, Colorado, or Washington and now being stationed together here. Even when goodbyes are said to friends, there is an understanding that we might see each other again at some point, at a different duty station! I was even able to connect two Chaplain families. See if you can follow me here. A couple we met when Ron was at Chaplain school (CHBOLC), and have kept in contact with, is currently stationed in a particular place. A couple we got to know here in Texas during the Family Life training course was sent to that same particular place after the training course was finished. I was able to get them in contact with one another and now they are good friends. That just makes me so happy! Yes, I firmly believe the Army (or any other branch of the military) is a mission field and opportunities abound to share the True Life with people who desperately need him. And I’m not just saying this because my husband is a Chaplain. He gets to minister in various ways, but so do I. Just as one example, not too very long after we got here, PWOC (Protestant Women of the Chapel) was going to start their fall semester and needed small group leaders–so I signed up. Never been in PWOC before, except for that summer session right when we got to Texas, but I knew I could lead a small group of women. I’ve done that before! It was an amazing semester of learning, discovering, praying, and crying together. God saw that group through a tremendous amount of heartache, difficult circumstances, and joy and it was a wonder to behold and be a part of. Yes, I’ve had somewhat similar experiences with leading women’s Bible study groups, but this was different. Something about being in such similar life-circumstances creates an atmosphere for ministering to one another unlike anything I’ve seen before. I know this is a sometimes “controversial” subject among military families because some have had not-so-great experiences with the big military healthcare organization that is TriCare. Personally, we have benefitted greatly from having it as our healthcare coverage. With our country’s current economy and (ahem) healthcare regulations, I am very grateful for the coverage we get at an absolutely unbelievable cost! 🙂 I have nothing to complain about. I believe God has given us an innate desire to know that what we do matters…that our lives are purposeful and part of something bigger than just ourselves. As Christians we can see and understand this through our relationship with our Savior and our participation in the body of Christ. We are each given a unique purpose, a special set of gifts, and a community within which to live all of that out. Recently, I’ve come to appreciate this in a different setting as well. The military is a community that exists for a unique purpose. From the newly enlisted’s oath to the highest ranking officer’s duties, there is a sense of purpose and service to something bigger and grander than oneself. There’s always stuff to criticize and complain about. The Army has its flaws and frustrations. And truthfully, others who have been in the life for way longer than I can speak with much more authority on the details of what it’s like. 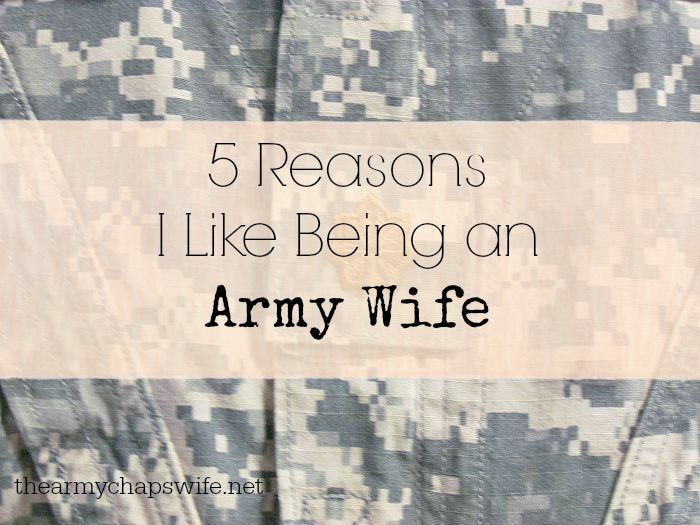 With only 3 years under my belt as full-time Army wife there are many aspects of it that I have yet to experience. Nonetheless, all I can speak from is my experience. Do I see some of the cracks and potholes? Yep. But I wanted to focus on what I have seen and experienced so far that makes me so proud and happy to be a part of this big Army family. There are more reasons than just these five, but I do believe these are the top ones. And now I’m going to swing by the commissary to pick up a few groceries. Hello! My husband goes to CHBOLC next summer. I appreciate your information here! Rachel, I’m so glad you stopped by. I hope everything goes well for him at school. Are you going with him?